Gardening is food for our body, heart, mind and soul! We just love surprises! Garden plants simply love throwing surprises and we simply enjoy receiving them! Such cheerful givers they are! Our potted plant was dead! We were pretty sure of that and thus just discarded the pot with its soil still intact at our backyard. But months later, maybe a little over two months, it suddenly sprang to life early last month! How wonderful and it wasn’t even cared for during the whole dormant period! Probably watered by the occasional rain and received sufficient heat/light from the filtered sun. 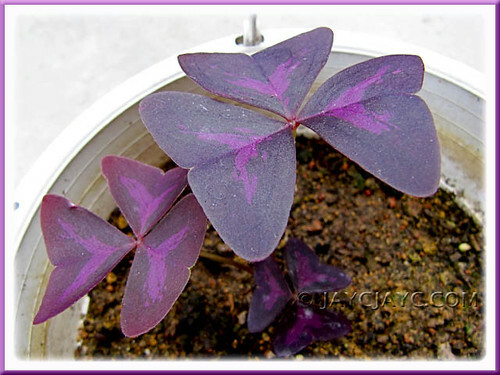 Name: Oxalis triangularis (Purple/Lucky Shamrock, Dark Leaf Shamrock, Purpleleaf False Shamrock). A member of the Oxalidaceae family and native of Brazil, it is an ornamental herbaceous perennial (or annual in non-hardy region) grown popularly for its beautiful heart-shaped trifoliate leaves. Yay, we’ll get to enjoy them again! Check here for more plant info. Jesus said to His disciples, “Therefore I tell you, do not worry about your life and what you will eat, or about your body and what you will wear. Another of our plant that was sort of written-off is the Caladium. We’ve observed for some time that Caladiums do undergo a rest period too in our tropical Malaysia, like those grown in the temperate region. We’re most delighted to see them appearing again! Have a peep at its marvelous foliage variegation when fully matured here and you’ll understand its attraction. 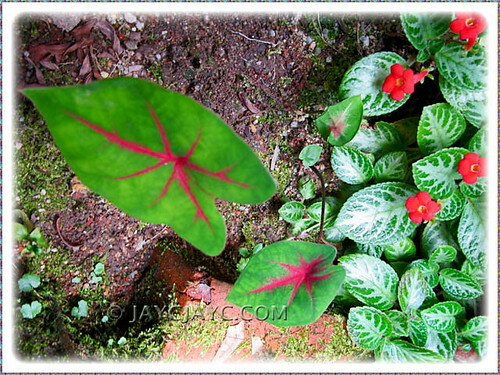 Name: Unidentified cultivar of Caladium bicolor (Fancy-leafed Caladium). Beside it, to the right, is Episcia cupreata ‘Frosty’ that is sprawling cheerfully with ample ground space for its restlessness, without any competition from its upright-growing neighbour! This cultivar has striking chili-red flowers that stand out beautifully against the fresh green and frosted foliage – simply fabulous! Other surprises were a couple of lovely self-seeders that are much welcomed to our garden party, never intruding or imposing but blending well with the crowd! One such seedling is Christia verpertilionis and the other is Jatropha podagrica. Name: Christia vespertilionis (Mariposa, Red Butterfly Wing, Island Pea, Aircraft/Bat Grass). It just emerged unexpectedly last month, sharing pot space with the Calliandra emarginata (Powderpuff Plant). Like the Oxalis above, this herbaceous plant is noted for its impressive burgundy-coloured leaves that are uniquely shaped like the wings of a butterfly or aircraft, hence the common names. It belongs to the Fabaceae family and is indigenous to Brazil and Southeast Asia. 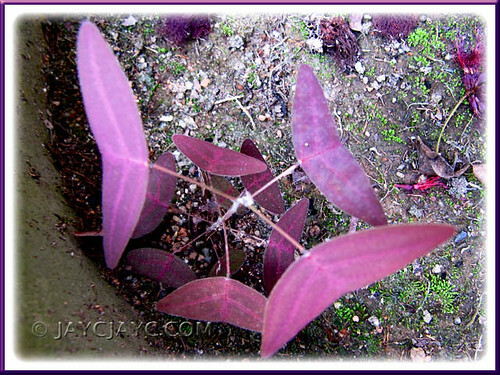 Know more about this plant here. 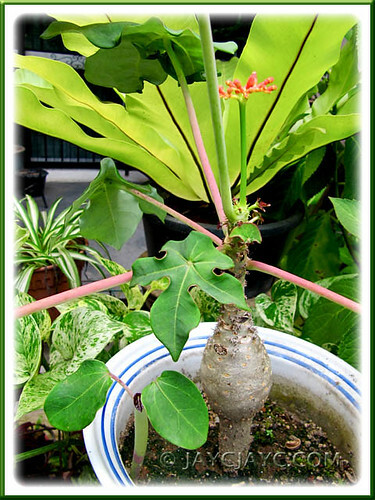 Name: Jatropha podagrica (Gout Plant/Stick, Buddha Belly Plant, Bottleplant Shrub, Goutystalk). Though unexpected, it was wonderful to find a seedling next to the parent plant. Usually, its highly dehiscent seedpod will explode when ripened and scatter its seeds several meters away. Find out more about Jatropha podagrica, an exotic member of the Euphorbiaceae family that is native to Central America. What a lovely comeback of all the coloured plants especially the oxalis and the caladium. That butterfly leaf plant too is very interesting. I too have the flame violets (Episcia) and I truly enjoy them as they do well in my garden. James : Thanks for dropping by and sharing with our excitement. I definitely can recall the lovely species of Episcia in your garden – it’s long cascading stolons is truly a sight for sore eyes…I’m so envious, we’ve never been able to get that fabulous length that you’ve managed to achieve! Autumn Belle : Sorry to read of your loss. Haha, I’m even more stingy than you…to even part with RM10 for a potted seedling is hard for me, what more RM20!! Thanks for visiting and leaving your kind comments. Wish you both a lovely Sunday and a great week ahead! The oxalis and christias are lovely. I would love to try growing them in my garden but I have not seen them for sale in the nurseries around KL. Where did you buy them? Thank you for your wonderful web page. I have learnt so much about the plants we grow here in Malaysia. You can get these beauties from nurseries along Jalan Sungei Buloh, that’s where we bought most of our plants. It’s Jatropha podagrica! The scientific, botanical or latin name of a plant are used interchangeably.